If you have driven by the old Grand Detour School just off Highway 2 north of Dixon, you have probably seen the activity taking place on the vacant building. Faith Christian School students and faculty are eagerly awaiting the opening of their new elementary campus at this site scheduled for this spring. Purchased last September by Faith Assembly Church on behalf of the school, the facility is under renovation in anticipation of Kindergarten through 4th grade students soon filling its classrooms. On the exterior of the building, a new roof will be completed by the end of the month. The interior of the school is being updated with a new state of the art fire and security system, new classroom floors, and other exciting improvements that will allow teachers to enhance the classroom experience for their students. The school will include classrooms for five grades, an art/music room, gymnasium and a library. “This renovation project is being done with a high level of excellence that is consistent with and complements the excellence in education that or principal and teachers provide,” states Jeremy Heller, Project Manager. In addition to the improvements taking place to the physical building, families and staff are looking forward to plans for an innovative outdoor area that will be used for both play and learning. Fallen trees have been cleared, and the ten acres of property will not only create room to build this outdoor learning center, but also will provide an abundance of space for students to play sports, games, and activities. 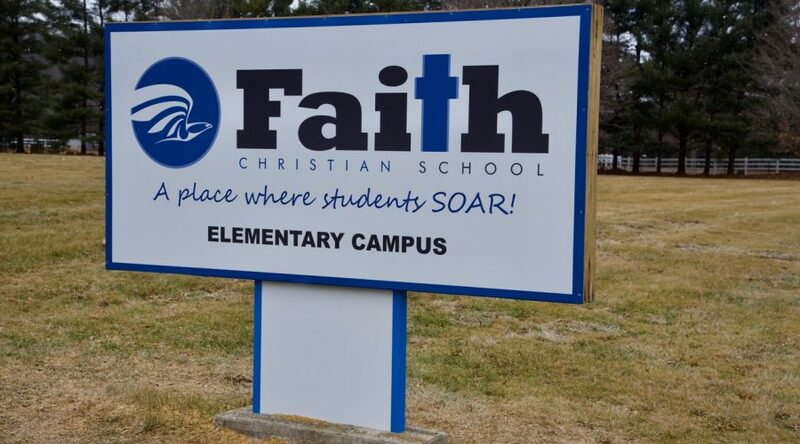 Faith Christian School is seeking financial partners for their vision to “SOAR into the Future”, which will provide Sauk Valley families an enhanced option for education that is committed to academic excellence and achievement within a strong Christian environment. For more information contact Faith Christian School 815-652-4806, or visit www.fcsfalcons.com.